Everything in this book is pure fiction. Its source is the author's imagination. But as is also true of any novel, it builds a bridge between fact and fiction. The free play of the imagination transforms experience into a new, different reality. When the author steps into the virtual reality of a software program, the App 4'33", and navigates that dimension as he would the real world, then the boundaries become blurred. The narrated world contains the act of its conception. It contains itself, as it were. So as long as we find ourselves in the reality of the app, similarities to real persons or events are purely coincidental. Outside the app we know that the world as our mind conceives it is in fact an image of external reality that has been edited by our senses. Nothing that humans think is necessarily as it really is, but much of it could be exactly as it occurs. 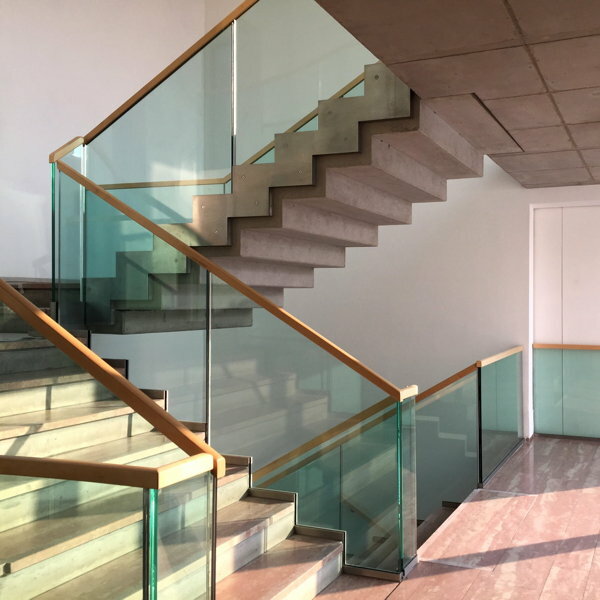 We meet the composer and professor of composition, Karlheinz Essl, in the town of Klosterneuburg, near Vienna. Essl met John Cage shortly after completing his university studies, and he worked with Cage in Vienna. This makes him an especially promising contact for us in our discussion of the App 4'33". Given the extraordinary demands that his life and career place on his time, I wonder if he will be able to spare a few moments to share his thoughts, while accompanying us into his own recordings on the App 4’33”. I begin by explaining to him that I use every opportunity to slip through these portals of reality into the virtual world of the app. When my mind travels from apparent nothingness to the locations of the recordings, I confront central questions about our existence: What is the world? What constitutes time? The music is certainly a conduit to a world. But what world is it? Is it a world that each of us perceives for ourselves? How does this world relate to the external world which we inhabit on a daily basis? I am particularly interested in Essl’s ideas on the matter, since he is a sound artist who creates worlds himself. Is he aware of similar experiences of traveling beyond the physical dimension? I’ll nevermore find peace again. Where I can’t have him there is the grave. The entire world has turned to gall. My poor head is going mad. My poor mind is torn apart. Gretchen’s monologue at the spinning wheel from Goethe’s Faust was already on my mind, for I had just heard on the internet the performance entitled FABRIC by Karlheinz Essl and his son, the filmmaker Simon Essl. They use the poem in that piece. Afterward I listened to Essl’s Youtube explanation, and then to a performance of the musical setting of Goethe’s poem that Franz Schubert composed in 1814. Every recording location is like an island. We enter into the sounds of a place and for four minutes and 33 second we find oneselves on an island. And then, if we so choose, we can extend our stay, or should I say our presence, or we can return automatically. Outside we hear the rushing sound of traffic. We walk with a moderate pace through the huge, now empty building. It houses an exhibit of important contemporary, mostly Austrian artworks. Then we use the next break, called Break II, to steal away again. 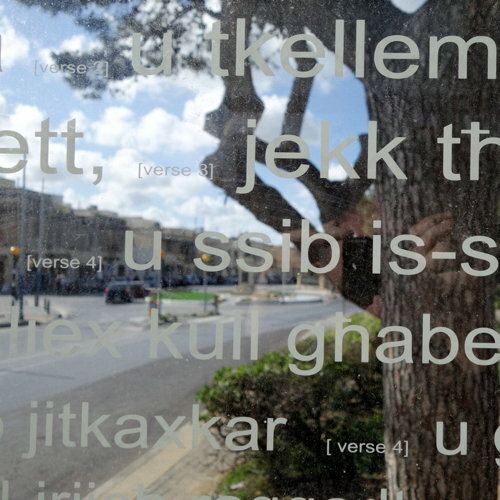 Malta, in the middle of the island. Mdina is a neighborhood in the city of Rabat. A historical location with a 2000 year history. We emerge again at the hotel, Dar in-Nanna, in the street called Triq Doni. 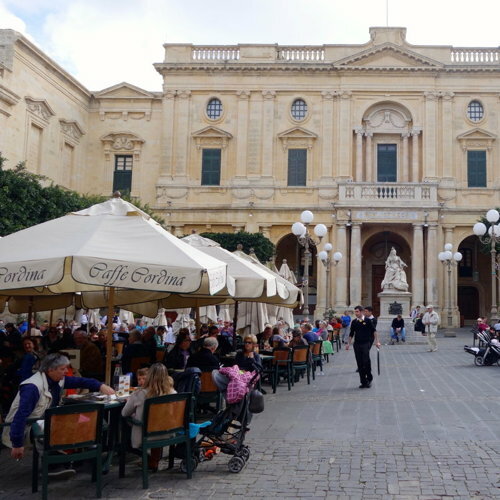 It is the first house on the square, not far from the Mdina and the Cathedral of St. Paul. Against this scene lies the familiar sonic backdrop, consisting of the drone of traffic, the buzz of people, and an atmospheric rushing sound. Sparrows accompany the scene intermittently with their chirping, and we hear a rumbling loudspeaker before the break. After the break this sound comes rapidly closer, and it seems as if a few more sparrows are awoken from their midday silence. A few cars roll through the street, before the scene is distracted by the siren of an ambulance. We are fully immersed here after only a minute and a half. The sparrows hold forth. The traffic stops in order to let the ambulance through. The sound of the ambulance gets closer and then farther away. We lean back and leave the window open. In the world of the app my fingers can take us there in five seconds. But relaxing is not so easy! We sit for that pre-determined span of time at that busy spot in an old palazzo, where the Caffe Cordina has been preparing and serving its delicacies for almost two hundred years. Valetta is the smallest of the European capitals. Its rich history and culture have earned it a place on the UNESCO World Heritage List. The subtropical Mediterranean climate provides warm spring temperatures even in winter. This Tuesday afternoon on the 25th of February, 2014 the streets are especially alive. Karlheinz Essl demonstrates for me, despite the whirlwind surroundings, how he can find a sense of peace like that mental state of silence. The voices of hundreds of people speaking surround us in the streets, a steady murmur, and the periodic clatter of coffee cups, the shouts of children playing, the clearing of throats, and laughter. A folding chair falls with a crash, and is set aright. The astute music professor and artist casually stirs his coffee. Pigeons step between the tables, cooing, peck at the crumbs, beg for more. Waiters serve their customers. Questions are posed, answers are offered. What does all this have to do with the span of the universe? More chairs are set up. The place is getting full. Karlheiz Essl is practicing the art of establishing peace in the midst of noise, by immersing himself in the tonal scene. It is a practice which he demonstrates again and again. In the Café Diglas in Vienna. Time clatters onward between scratching cake forks and clinking coffee cups. We are there, taking part, listening to the flutter of voices around us. What they say does not matter. The noisy tapestry serves as a filter. Nothing disturbs the inner quietude. 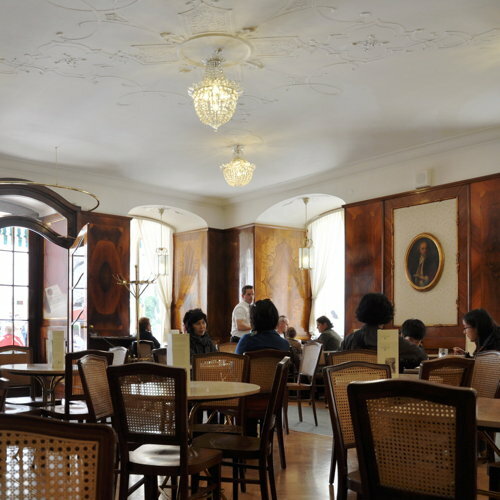 The same scene in the Café Tomaselli in Salzburg! A tapestry of seemingly banal voices facilitate us entering into a state of meditation. We exit the linear time of every-day activities and enter into the tonal realm of John Cage. These little coffee house scenes are retreats, caves, sanctuaries. The person who gave me access to this place of refuge is clearly alone amidst all those people. He is taking in the solitude-turned-to-sound that he has sought here. He separates himself and enters into himself under the cloak of the surrounding sounds, and there he reposes. And again in the Salzburg Cathedral. At the train station, waiting for a train. The meaning of the particular sounds is immaterial for him. He simply enters and sinks into timelessness. For Karlheinz Essl every entry point is a temporary exit from his noisy surroundings. Did he achieve his ability to repeatedly achieve this mental state from his early work with John Cage? At this point I must radically re-think my concept of world. At the beginning of the millennium I began to paint, in response to the sudden appearance of that internal blanket of sound known as tinnitus. The loud, high-pitched tone in my head appeared clearly to me as the color, orange. I painted that tone in numerous oil paintings, both abstract and representational. The hopelessness of my condition pushed me into a deep depression. I perceived the depression as a deep black. Night after night I worked on a series of “Black Paintings,” immersing myself with heart and soul in the color black. I practically bathed in black. I made haptic works, rubbing the oil paint into the canvas with my fingers. When I used blue I noticed that the tone in my head calmed down a bit, and I was able to think more clearly. Later I realized that in this reality black can have many different colors. People liked my paintings, so in addition to my position as a school superintendent, which I had resumed after my medical leave, I began exhibiting, first hesitantly, then ever more actively. I took my paintings to other cities in Germany, and as a result exhibitions followed on the Spanish island of Mallorca, in Vienna, and finally in China, in Beijing and at the University of Tianjin. It was at this time that my mind opened to people’s various perspectives and sensitivities. In the process it became clear what impressions Mr. Korn had gleaned from the participants of the Dokumenta, the “world’s most important recurring exhibition of contemporary art.” Since then the “world” means much more to me than the way we think of it in our every- day language and lives. It is now clear to me that every human being, indeed every living thing, constructs their world at any given moment with the perceptive capacities at their disposal. I’d like to use the term, “worlding,” to describe this process, an ambiguous term which is used in various contexts and with various meanings. This morning I noticed that the parent birds who had built a nest in the hedge near my terrace stopped feeding their six babies. Were the babies old enough to leave the nest? Last year I put a recording of a different bird’s nest onto the App 4’33”, to document the acoustic world of the young birds. I am convinced that this too belongs to the realm of John Cage’s music. The recording was successful. I attached my iPhone to a long pole and held it level with the loudly peeping babies when the parent birds brought food to the nest. In the intervals when the parents are away we hear the tonal scene that any baby bird hears, sitting in its nest in a middle-European village: traffic, barking dogs, voices and conversations. This recording, entitled BIRDMOMFEEDSINNEST, takes place in Kaufungen, Germany. It, too, is world communicated by sound. Yesterday the failure of the birds to return turned to crisis. My wife made me aware of the constant, loud chirping of the babies, but I could not hear them at all. I deduced that the chirping was in the range of one of my inner tinnitus tones. The peeping corresponded with the color orange! So I attached my iPhone to a pole again, and I was able to hear the fearful peeping of the birds through earphones. What we fail to see or hear stays outside of our world. Furthermore, what we hear effects our actions more than what we ‘merely’ see. We perceive all the images of immigrants almost drowned in the Mediterranean merely as pseudo-events from the world of news, far removed from our own world, and not as cause for action on our parts. Yet if six young birds scream for food, our heart is moved. Karlheinz Essl has just reminded me that there are special regions of the brain dedicated to triggering our emotions through auditory impressions. In the course of the afternoon the little birds fled the heat of their nest, one by one, and fell helpless and parentless onto the terrace in the sun. I gathered them up, brought them into the shade under a tree, and carefully doused them with water. Then I let them be. I read on the internet that parent birds do not reject their babies after they have been handled by humans. The birds do not react to the sense of smell. So I placed them back in the nest. But all day long, the parents never returned. And since the little birds made no attempts to fly or to look for food, I took over the job for them. I placed the six exhausted fellows under a protective rhubarb leaf and searched for worms, isopods, snails and spiders under rocks in my yard. They excepted my meals clumsily but thankfully. After about two hours I reached the limits of my abilities. The resources for nourishment were running out, and night was approaching. I made calls to the local veterinarian, the animal shelter, and even the fire department, all to no avail. No one really knew what to do in such a case. I finally left my orphans to their fate, and I comforted myself with the realization that someone besides me was responsible for their fate. After all, it was the parent birds who had abandoned their babies. Who was I to disturb the course of nature? One or several of the babies might survive the night, if a cat, a weasel, or a hedgehog did not make a meal of them. One can find the echoes of this story on the App 4’33”, entitled FLEDLINGSALONEINNEST, located east of Kassel on the app map. Why do I tell this story at this point of my narrative? It occurs to me that a sound recording taken from real life cannot provide sufficient context for such a story, despite the best powers of imagination that a listener can bring to the scene. A tonal track of the pitiable begging of the six baby birds does not achieve viability as a story until the surrounding circumstances are explained: An old man in his world crawls on the ground in his yard with a tweezers, lifting one stone after another in search of bird food! A strange scene, one that belongs in a Kafka novel or a Becket play! The orange-colored chirping of the helpless birds activates his old patterns, until he learns to recognize that this event originates in his inner world, and is utterly inappropriate to the external world. Understanding world by deeply listening into world is one thing. The other is immersing oneself in the totality of our inner tonal being. It is immaterial whether this is found in a tone that is essentially internal, or if it is found in a tonal scene that comes from outside, as the continuously sounding environment of a coffee house, street noises through an open window in New York City, a park bench in Paris, or the sound of the ocean elsewhere in the world. Paris, a Friday in July, 2014, around eight o’clock in the evening. We are sitting on a park bench on the Champs de Mars. Almost without exception, the geographical locations on this earth have historical meaning, and their history is always present. It gives the place a certain aura that we can feel. This huge expanse of green was originally used for agricultural purposes, until the Ecole Militaire was built and in 1769 the field was turned into a military drill ground. The place tells of spilled blood, and of reconciliation. The motto of the French Revolution, “Freedom! Equality! Brotherhood! (Liberté! Égalité! Fraternité! )” marked the end of absolute monarchies in Europe. The Champs de Mars is and always was a loud, noisy place. The history books tell us that on July 14, 1790 Louis XVI pledged his allegiance to the constitution here in front of 300,000 people. Exactly one year earlier, on July14, 1789, the storming of the Bastille had unleashed the French Revolution. Exactly one year later, on July 14, 1791, on the second anniversary of the Bastille, troops bloodily suppressed riots here, in what came to be called the “Champs de Mars Massacre.” On four occasions the Champs de Mars served as the location for world exhibitions, and once athletic competitions for the Olympic Games were held here. Today this place is much less spectacular. On this particular warm summer evening the mass of people gathered here make a leisurely impression. They are enjoying the beginning of the weekend. A good number of tourists blend with the Parisiens, a fact that we can hear from the multi-lingual sentence fragments reaching our ears. We approach the Eiffel Tower, built out of iron from 1887 to 1889 to a height of 324 meters, and until 1930 the tallest human construction in the world. Today it remains one of the most famous landmarks of France’s capital. 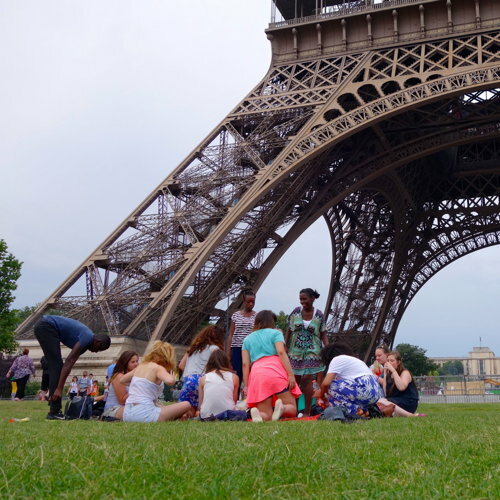 Karlheinz Essl documents this important geographical location on the app with his recording entitled, TOUR EIFFEL. Is not every location at which we find ourselves at that moment the center of our world? We have been sitting here together for quite some time, watching the lively activity around us, and using the sound scene to immerse ourselves into the history of the place. “Karlheinz, how did you come upon John Cage?” His answer burst forth as if he had been waiting for the question. I myself am a teacher who worked for many years with children and adults, so I can sense the magnitude of the spirit that expressed those words. Since then Karlheinz has become a world-famous composer and recognized expert in musicology. He laughs, a little embarrassed, expressing the spiritual attitude that he apparently gleaned from John Cage. Karheinz Essl lifts his right leg that he had crossed over his left, and puts his foot on the ground. It occurs to me that for the longest time we have been sitting in exactly the same position on the bench. At your next opportunity, pay attention to how much our body language mirrors our agreements or disagreements. Now I too lower my leg and place my right foot on the ground next to my left. Every change of our sitting position has meaning, even if it is not immediately discernible. But now the time seems right for another change of location. Traveling on the tone documents of the app dedicated to John Cage means allowing your spirit to actively and soundlessly glide across to the other, imagined space in which his presence appears in the sound of his past reality. ‘Reality without pretention.’ I like the phrase! In the meanwhile we have arrived on the coast of Brisbane. The Capital of the island republic of Queensland lies in northeastern Australia, a thousand kilometers north of our first visit to this continent, in Wollongong. Never before have I heard of the name, MINJEMBA ISLAND. This brings me back to the topic on which I most like to hold forth at the moment. Karlheinz Essl looks at me puckishly over the rim of his glasses. I have the distinct feeling that he knows exactly what needs to come next. 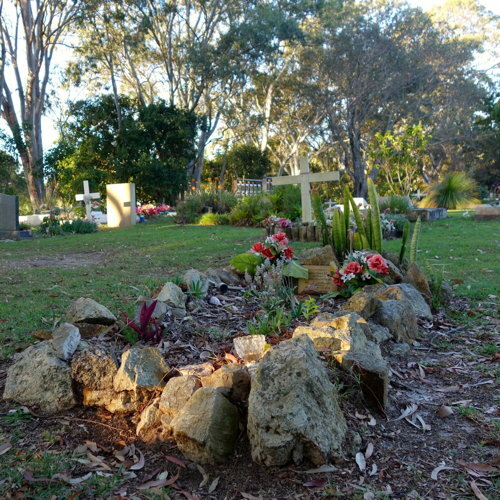 Humpybong Park in Redcliffe is a popular park, which especially attracts families. From our bench we have been watching two families of Eurasian coots in the narrow north eastern corner of the park, apparently engaged in a bitter fight on the water before us. Due to its closeness to the ocean the water is affected by the tides, moving with the lunar rhythms. Water fowl, also called rails, are found all over the world, in addition to the Arctic and Antarctic. The Australian coot is a member of the same rail family to which the crane belongs. It is a relatively small, duck-like waterbird with short wings, long legs, and large lobed toes. It has slate colored plumage. You can recognize it by its beak and head shield, both of which are white. One seldom sees them fly. They spend most of their time in the water, rocking their heads, and diving under the surface with a little forward hop. Rails eat plants, roots and seeds, but also animals, such as insects, worms, spiders and crabs, as well as smaller fish, frogs and polliwogs. So much for the information available on the internet. Now what do we hear? We are acoustically experiencing a formative social scene in the lives of these birds. The title that Karlheinz Essl gives for his recording in the app, COOT FIGHT, draws our attention to the basic situation, a fight of rivals. In the recording itself we hear just a jumble of loud, discordant shrieking, yammering and wailing of animals. The precise meanings that the members of the group are communicating with theses sounds remains beyond our human comprehension. Is it a territorial dispute or a courtship rivalry? We are not privy to its meaning. It clearly involves the frantic flapping of wings and paddling of feet, for so much is clear from the sound of the splashing water. The birds‘ vocal repertoire is large and varied, and mostly monosyllabic. It seems to me, the less meaning we can discern from such a tonal scene, the easier it is for us to distance ourselves from interpreting. Isn't this precisely what is required for us to enjoy the music in its pure form? Is there a pattern here? Bird experts, such as Stuart, whom we met in this book working 1000 km farther south on the same continent, could certainly research if there are regularly reoccurring tonal sequences. Moreover: as a bell miner expert he would certainly be able to identify a certain intonation as a warning cry, or as a different kind of communication. I have built a little pond in my yard. I have a few goldfish in it, parents and ten of their offspring. They survived the winter and are developing nicely in their second year. When I feed them I notice the following pattern: The four smaller, red fish eat as soon as the big ones have finished eating. Only after the red fish have finished do the black smaller ones hesitantly take their turn. It is always the four lively, red babies who first discover the new food. The total cacophony of the rails in this pond, I assume, represents a type of ritual. I must wait a long time for an answer to my question. Was he annoyed by my crazy mind traveling idea? Granted, I am not just using the documents on the app, I am also presuming to perceive personalities, characteristics, habits and even ideas, which are in reality my own, and could be an unreasonable imposition on my interlocutor. Together we once again step out of the app, and then return to find ourselves in one of the most beautiful places in the world. Not that I am there physically. Nor can I use the word, "beautiful", in a visual sense. No, it is the tonal scene that is beautiful, breathtakingly beautiful! Karlheinz Essl’s recording, STRADBROKE ISLAND, makes it abundantly clear that there are vast differences in the tonal psychological character of places on this planet. Once we have entered this scene, we want to stay, despite the fact that our pure listening does not make it possible to identify what we are hearing. It is that silence that Victoria was seeking in Antarctica, and that found for just a couple minutes. I am certain that if the spirit of John Cage occasionally were to listen to this app dedicated to him, then he would go to places like this. He would not be attracted to the many recordings of street traffic in New York City, but rather to these places that one can truly call "living silence". Listen for yourself! No, I will not give a copious description of this paradise here. Again and again I listen to the sumptuous multitudes of fauna, and always up to about the third minute. For at that point something appears that makes us anticipate human activity. Can it be true that the droning slowly but surely entering the scene is the sound of a bulldozer? I am not able to figure out what it is. But by minute 4’33” I ask myself whether the bird voices, which can still clearly be heard, are not really complaining about this intrusion into their world! I listen to the scene repeatedly, and I notice that the apparent construction sounds were present in the distance from the beginning. We are on the northern end of this gigantic island. The island consists primarily of sand, and off the northern coast lies the largest coral reef in the world, the Great Barrier Reef. This place is called Amity. 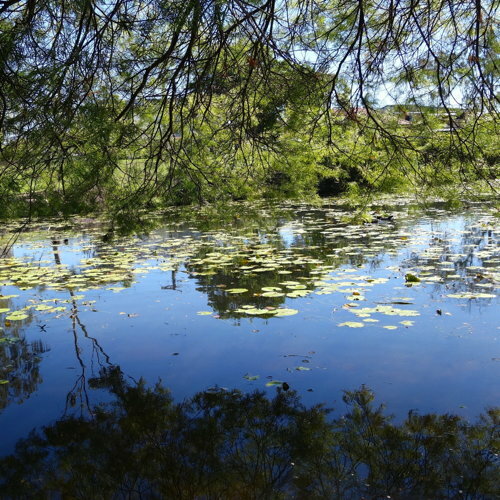 It lies on North Stradbroke Island and is designated a recreation reserve. Karlheinz is sitting on the grass at the foot of a grave in the middle of a cemetery. Next to him lies the bicycle which clearly served as his transportation. I never would have thought that a single image like this photo could so clearly show me the nature of an illusion. It is precisely the “imag(e)-ined” image that is its essence. The so-called reality of this place which is documented in this photograph reveals the seductive power of the purely auditory realm. Essential information gets lost in a purely auditory recording of the microcosm of this place, its totality of time and space and all the matter and energy contained within. It's the same as with that nest of baby birds, whose cries remain naked and empty without an understanding of the situation. I realize now that ‘Deep Listening’ cannot convey the information that sight can convey. The perceptive understanding of an auditory scene is not complete until we perceive the corresponding image. Is it likewise true that a concert goer’s experience of the music is made an authentic experience by imag(e)-ined scene? There are sound scapes that are particularly conducive to repeated listening. It is easy to let our thoughts “surf” on them. After saying this, Karlheinz takes me by the hand to lead me through the tonal portals of the app. He understands that one can only find new awareness by confronting the new and the unusual. Traveling with your ears, too, requires change. In no time we find ourselves in southern Europe, emerging in another cemetery, this time in Rumania. 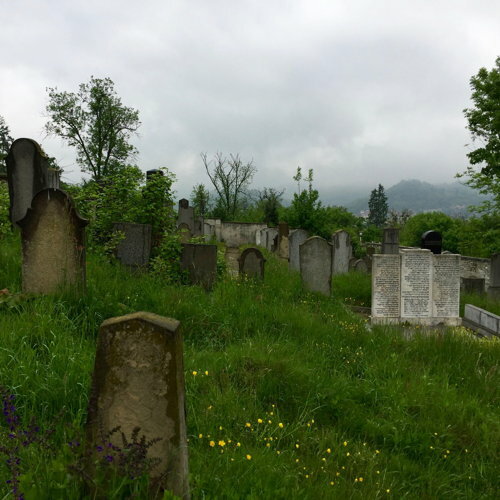 The recording gives us our location with the succinct title, CEMETERY MEDAS. We are surrounded by impressive stones that themselves would be worth the trip, were we able to see them. For the listeners, confined to the sense of hearing, only the tonal scene is accessible. Is it possible to put the contextual information provided by the title out of our mind? “When you extinguish sound and meaning — what do you hear?” At the moment we entered this new scene — it was as if someone had whispered to me the well-known zen koan. Again we are sitting together on the ground, close to Mother Earth, listening to the tonal truths. Swarms of black crows circle ominously in the sky above us. At first the few remaining songbirds in the surrounding bushes protest shyly with their song, but soon the cawing masses of crows overwhelm them, and they fall silent. Occasionally a pigeon shyly objects, and then leaves. Everyone who has dedicated a portion of one’s life to something considers oneself an expert. So I too start to hold forth on what I have learned from my experiences. “For me there is one particular type of recordings that I call ‘stories’. With those an identifiable situation is usually clear from the beginning. Usually the narrator, that is, the one who produced and uploaded the recording, identifies the story line with the title. Then the ‘story’ involves chronology of events. For example, if you indicate a ‘Coot Fight‘, then right away you draw the attention of the listener to a particular scenario. My interlocutor lets me go on, and so I do: “A third category is less common but equally interesting. It has to do with what I would call ‘mystery.’ that is, something undefined or puzzling. This overlaps with the other two categories. These recordings fascinate me because I never heard them before, neither by themselves, nor in combination with sound, rhythm, or a narrative. Some examples are LUCIER LONG THIN WIRE by Guy Dammann in Reykjavik, Iceland; your own recording from Funchal on Madeira, MONTE:TELEF&#XE9 and XMASEVE101, by Charles Amirkhanian, from Fresno, California. Here on the ground, in the proximity of the innumerable, unknown dead, that reality lies apparent before us, stripping away the preferred everyday illusion of our comfortable, western lives. And I sense that it is only the music that could bring us to this point. We are deeply immersed in this scene now, which like the others is a unique tonal event. The interplay of the sequence of sounds, the tone frequencies, the atmosphere and the rhythms is a unique resonating experience, and as such will never recur. Even if it were possible to write a graphic notation to capture the randomly occurring sounds, no orchestra in the world could perform the score in the concert hall. Nevertheless Karlheinz found a way and a revelation is at hand: “There are two fundamental conditions that comprise the influences of John Cage.” He speaks with the awareness of one who is about to touch on the core of the cosmos. After our fleeting visit among the gravestones in Romania we have suddenly landed on the Portuguese island, Funchal, in the middle of the Atlantic. 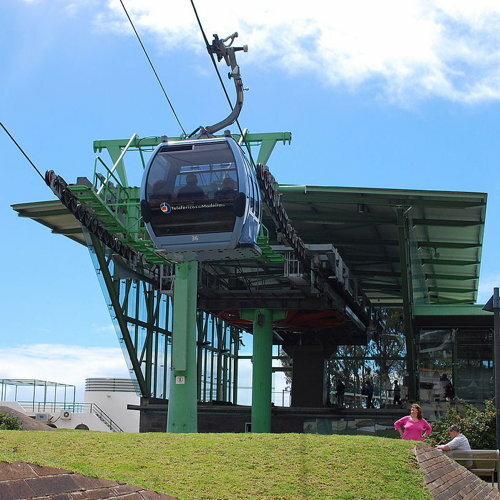 The recording, MONTE TELEFÉRICO, projects a steady tone, and considering the location, it could be the sound of the cable car, which leads to this place above the island’s capital. Karlheinz Essl looks at me over the rim of his glasses, as if he were trying to discern what manner of creature I am. I am already beginning to regret the fact that this short but intense discussion, which has taken us halfway around the world together, will soon come to an end. In the meantime we are just a few hundred meters east of that annoying cable car sound, and relax in the sound of the chicken farm in the above mentioned recording on Madeira. Here, too, near the chicken farm on Madeira, stands a pleasant, little bench, and we sit down. It is a cozy, shaded place, perfect for enjoying the silence of the surrounding sounds. “Exactly!” Essl says and places his right foot over his left knee. A moment later I do the same. “PiTTo, since we have all the time in the world, could you please explain to me more clearly what you mean?” He says this and removes his foot from his knee, in order to lean back on the bench. In the meantime the recording of the chicken farm starts its repetition. “Well, let's take for example the bell tower of the Church of the Three Kings in Dresden. I know from an earlier visit that the bell tolls at exactly 12 noon. On October 10, 2015 I was traveling through the city with my wife. We arrived shortly before noon and I had the idea to climb the tower with the App 4’33” running. I knew that it required a strenuous climb over several iron staircases to enjoy the spectacular view from the church tower. And at the foot of the tower one needed to buy a ticket. So time was short. In order to get onto the tower one needed to climb past the platform with the bells. I also knew that if we did not make it past the bells before they started ringing at 12 noon, being on their level could be a very loud affair. At the beginning of my recording, entitled CLIMBINGTHEBELLTOWER, you hear the sound of two people climbing the iron stairs of the tower. Now you would say that by choosing this subject, I entertained a compositional idea, the notion to compose a piece, the topic and time span of which were determined by my intentions, and yet unfolding without my influence in actual time. Correct?” Karlheinz nods. “And now coincidence comes into play. I still have to smile when I think of the chain of events which makes this recording so special. I climbed ahead of my wife, because the stairs were very narrow. You can clearly hear the footsteps of two people. Suddenly I noticed that she remained behind, but I didn't understand why. Since I was very close to the level where the bells would start ringing, I was very concerned to move on to the top as quickly as possible to avoid the noise. But since my wife remained behind this now seemed unlikely. As it turned out the overwhelmingly loud ringing of the bells begins just as I am standing directly next to them, waiting for her. It is at the 1:17 mark of the recording. “Yes, the bells...” he says and then stays silent for a while. The recording stopped and we start it again. We sit silently for a while and just let the screaming of the birds happen. It is clear to both of us that it requires no commentary. In this meeting with the Austrian composer, Karlheinz Essl, I have come to realize that we perceive music on various levels. It is not dependent on the understanding of the listener. Music is simply reality. It just is. Period. We Westerners, especially, constantly seek a rational explanation for everything. We insist on explaining the mystery. We could very easily enjoy music as a pure phenomenon of sound, if we would only put ourselves in that state of mind. Is that what John Cage was getting at with his composition, 4’33”? He lets the fifth or sixth repetition of the chicken farm concert come to an end, and then he takes us back to his home country, Austria. We find ourselves in the quiet repose of a little chapel deep in the forest, north of Lake Wörther. We step into the sacred space which stands open as a refuge for anyone who needs it. Yes, indeed, how well I know that experience! The question remains unanswered, for just after we enter the chapel Karlheinz moves behind the altar to pull on the bell rope. Later the recording will document — what a coincidence — that just as when we climbed the tower in Dresden, the time now is exactly 12 o’clock! A clear, sharp bell tone tolls and travels through the valley. It must be a sign. But of what? I had never seen it that way before. For me a church bell had always been a means of communicating a message. On Sundays in the village it announced the time to go to church. At noon it implore us turn inward and to God. For centuries it structured the shape of our days. As such, it was a means for the church to influence the everyday lives of the people. After the first break in the recording on the app the ringing ends. The composer pulling the rope wants it that way. The bell falls silent, and so do we. Our thoughts fill the silence, accompanied by the occasional bird song heard through the open door. Yes, Karlheinz, I understand! Silence is accessible anywhere. It depends only on our state of mind. It can be found even, indeed especially, through heavy sounds, if we just allow the silence to enter in. It requires our own inner silence. We must concentrate our spirit on timeless eternity. Not until the third repetition do I again attempt to address the composer, sitting now before me on the little church bench, deep in his own meditation. We found this to be as simple as it was baffling. It is true that even not communicating communicates something. The notion of “meta-communication,” that is, communicating about communication, played a big role in those days. It also played a large role in our understanding of structures. What does Karlheinz Essl mean to tell me now with this kernel of wisdom? Perhaps everything placed on the app is a form of meta-communication when it is called up again and listened to. What is he trying to say? Will we attempt meta- meta-communication? Today Karlheinz is dressed completely in black. I just noticed that he is carrying a little black attaché case, which he set down on one of the church benches shortly before the church bells began to toll. Now he takes out a mini computer with a screen and two speakers. In no time he has set them up on the little altar to the left and right of the simple wooden cross. Then he begins recording on the App 4’33”, and simultaneously he plays the recording of a concert which he recorded in a different place. I follow the proceedings, fascinated. Finally, with the help of this little trick, sitting on this church bench, I can give myself over to pure listening, and do not have to search for the meaning. The colors that appear on the screen are exactly the same as the colors that Sam has emanated ever since he has been living in me: all the tones of black, orange, and a little blue. The special thing about this experiment, however, is that it is a recording within a recording, and yet it feels like pure reality. Only much later is it revealed as an artwork. He recorded his piece, Brisky Breath, for computer and kalimba, during his stay in Brisbane. He presents it here in tones and images. We see the composer at the center of a circle of silent, listening musicians. He is performing simultaneously with a kalimba and a computer. Does everyone present fully understand what's happening? Three elements come together in this music: the composer, who conceived of the idea, the instrument, which produces sounds and sequences to which our ears are unaccustomed, and the computer program, called m@ze°2, developed by the composer for this purpose. The composer provokes coincidence by bringing these elements together into an improvised ensemble. The “concert” occurs through its staging. Something is both performed and presented. Through that process it takes on meaning. The meaning lies in the performance itself. I am baffled. But then I realize that Karlheinz Essl has made it his mission to hold up a mirror to the music world. Everything here seems to me “artistic.” But what does that mean? Isn't it just that sense of “artistic” that turns such a piece of music into art? These sonic artworks shake us up, but only those of us who are ready for such an awakening! Despite the fervent admonitions of people like John Cage, the world is not fully ready to perceive them. The toneless silence of that chapel sanctuary makes it possible, after the bells toll, to transition into that timeless truth that lies beyond all events. This positive energy is necessary to counterbalance all the negativity that pulses through the world. The magpies in Brisbane greeted Karlheinz Essl every morning with their nature-given energy, and they inspired the composition in which he both highlights them and builds a contrast to them. A breath of the atmosphere of Brisbane makes me aware that much could be different for this energy-laden world. I cannot avoid noticing that I am feeling a bit of shame. Did I need to wait until now, sitting in this Austrian chapel, before I was able to see what was really fully apparent in the app all this time? The perpetual loop of this composition, 4’33”, is the answer. Cage’s intention, given the loud environment of his New York apartment, could only be realized by following a path of inner immigration. Yes, they do exist, these places of silence and sounding energy! We have had them stored in the innermost recesses of our brain. They are still there, but they are deeply buried. We need to become aware of them. Only in that way can the music transform us and possibly save the world. And again the 30 second bell tone, followed by the silence of the recording in the Joseph Chapel. Now the Brisky Breath dissolves in meta-communication on the altar of silence. The question remains unanswered for a moment, for once again, and for our last time together, we change locations on the earth. We slip out of the portal of the app, only to step back in at another place. In no time we are back in the app, and in our fourth airing, near the Cathedral of Notre Dame in Paris, surrounded by the cozy atmosphere of a chamber concert. The sound of the string instruments tuning fills the room. We hear violins, a viola, one dominant cello. The musicians warm up with their familiar intervals and runs. The sound pulls our spirit into the tonal scene. Several of the people in the audience are speaking loudly and unselfconsciously. Immediately it occurs to me that what we are about to hear is a piece in the spirit of John Cage, not just the music as such, but the entire event as a whole. The guests are waiting for the concert to begin, and do not realize, at least in the meta-communicative sense of the app recording, that it has already begun. The chatting of the audience is contributing to the result. The well informed concert goers are fully aware of the audial cues that indicate the start of the concert within the concert. It is so pleasant to be in a familiar space. And so the first segment of the recording unfolds, and picks up again after the break. The players tune their strings; the visitors exchange their thoughts. It reminds me of the recording of the chicken farm, until the 1:23 mark, when presumably a visual sign from the musicians start the piece. Then chaos transitions to ordered sound, structured by the composer and coordinated by the musicians. We hear the famous-infamous Canon in D Major by Johann Pachelbel. The audience falls silent. The random chatter of spoken thoughts gives way to the order of instruments playing in harmony. Here there clear structure. The rhythmic accentuations, it seems to me, emphasize the structural form. “Oh, I like this piece,” I whisper to Karlheinz, who has settled into the chair next to me, recording with his iPhone in his hand. “One needs to hear a piece often before one can like it” , Karlheinz whispers back. Sam agrees. He feels comfortable in me and I in him. This concert, which appears as a span of time, is really a condition. And that condition holds forth beyond the 4’33” mark. Is entering the meta-level of awareness a condition that rises above literal experience? It is still holding forth when I arrive at “sandra,” a few hundred meters further north, at the Cente Georges Pompidou. Her pleasant voice whispers in my ear, and her voice leads me gently into the infinite space of this recording. 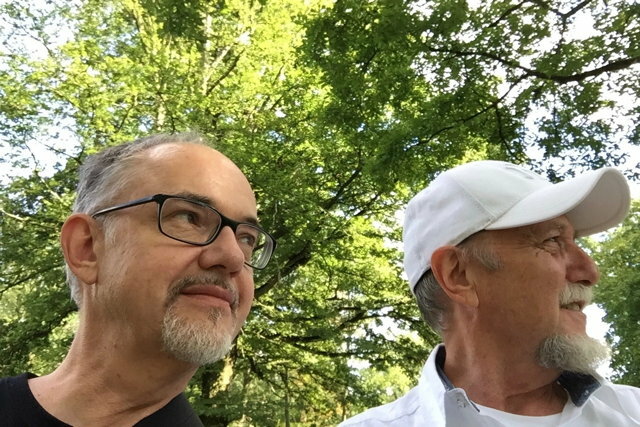 Dear readers, listen at your convenience to the two recordings by Karlheinz Essl, entitled PLACE DES VOSGES, uploaded on July 19, 2014, near the Notre Dame Cathedral in Paris. Then follow that by listening to the contribution from “sandra,” who is unknown to us and yet feels familiar. It was recorded farther north and is called CHAMBRE AN&#E9;CHO&# XEF;QUE. Yes, it seems to be the same woman who we can meet again, if we wish, on the Azores! 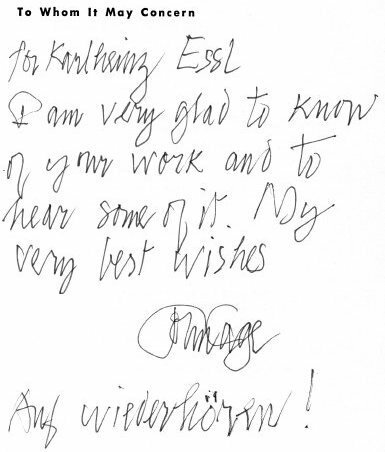 Shortly after my return from Paris I receive an email message from Karlheinz Essl. He shows me how easily I can slip into illusion, enchanted by sounds and carried by emotion. 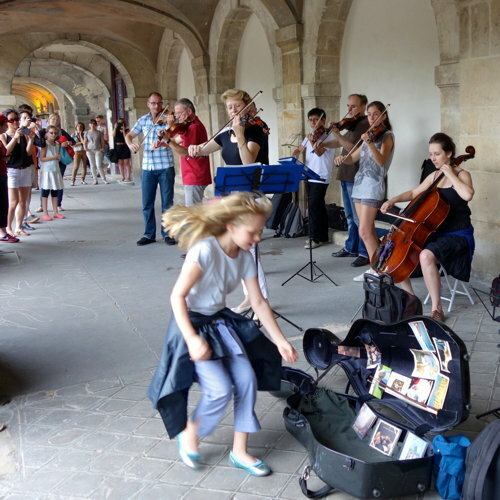 The app contributor and composer of the meta- communicative recording, PLACE DES VOGES explains: “I was walking through the trellis covered arches with my wife when I heard the familiar sound of strings tuning, great nourishment for the App 4’33”. I couldn’t have guessed that the musicians would play this old favorite. This is what it looked like: For a moment I am baffled. The recording gives no indication that the music was not performed in a concert hall, before a formally assembled audience. Somehow the situation befuddled me. I couldn’t make sense of it. I thought, this must be exactly how a blind person feels, trying to orient himself in a material world without light and images! We are not concerned here with right or wrong, but rather with finding a deeper awareness. What really is a concert? What role does illusion play in any performance? 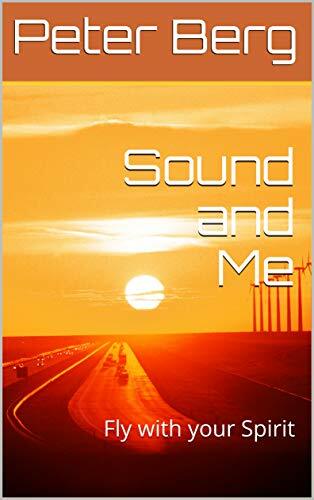 In relation to our travels through sound with the help of music, I am particularly interested in Karlheinz Essl’s treatment of time. Our meeting in the app must be more than coincidence. Perhaps it is serendipity, a coincidence fortuitous to both sides. That would mean that our cooperation is about to continue.